This entry was posted on Friday, November 7th, 2008 at 4:41 AM and is filed under Security, Storage, VMware. You can follow any responses to this entry through the RSS 2.0 feed. You can leave a response, or trackback from your own site. Great article…I hope I will have the time to test this in my lab one day..
two freenas iscsi target (cause it boot from usb, and I have all disks free). the opensolaris vm is sharing storage via nfs to vmware vsphere cluster. At the moment I am working on the failover of the initiator/nfs server and ethernet bonding. what do you think about this way ? That method is fine. NFS is a protocol that also works well when virtualized. when will you have the GFS snapshot script. Also is the vm in a consistent state when the snapshot is taken? VM consistency actions like quiescence must be initiated externally from the script. The VMFS volume will be consistant. Thank you so much for having this blog, it has been incredibly helpful. I am using a solution similar to yours however I have questions about the consistency of the virtual machines. I hope this makes sense, I have two opensolaris machines with a bunch of hard disks, one acts as a iSCSI SAN, and the other is identical other than the hard disk configuration. The only thing being served are VMWare esxi raw disks in physical compatibility mode (no vmware snapshots), which hold either virtual machines(combination of various *nix and windows servers) or data that the particular virtual machine uses, I.E. we have exchange 2007 virtualized and through its iSCSI initiator we are mounting two LUNs one for the database and another for the Logs, all on different arrays of course. Any how we are then snapshotting this data across the SAN network to the other box using snapshot send/recv. In the case the other box fails this box can immediatly serve all of the iSCSI LUNs. The problem, I don’t really know if its a problem…Is when I snapshot a running vm will it come up alive in esxi or do I have to accomplish this in a different way. These snapshots will then be written to tape with bacula. I’m not sure what you mean by “when I snapshot a running vm will it come up alive in esxi” but I assume its about the include memory snapshot option. If you snapshot a VM and include the memory image you can revert to that snapshot and it will have the same state the machine was in at the point in time the snapshot was created. There are some exceptions to this action. The uuid of the machine and underlying infrastructure cannot change. e.g. CPU model, CDRom client attributes etc..
Generally this would be a manual function after you power the VM back up. Hi Mike! I read articles in your blog and i find it’s very useful for me. I try to implement something like described in this post, but i use COMSTAR’s iSCSI target. We have 2 ESX hosts and one shared storage server with OSOL b134 on it, and we want implement backup storage on VM, that placed on one ESX host (that have large local storage). I configure zfs snapshot’s sending/receiving from shared storage server to backup storage VM with bash script provided in this post. I have some question: how can I copy (automated) COMSTAR’s iSCSI target configuration from ss1 to ss2, and what steps i may produce after ss1 fail for disaster recovery. You have discovered that COMSTAR is very different. Define all your host groups, initiators, targets etc. for both ss1 and ss2 on ss1. And there you go a completely migrated COMSTAR config and LUs. Thanks for your reply Mike! Also I can’t do svccfg export -a stmf > stmf.cfg from zfsadm user (but svccfg export stmf > stmf.cfg works fine). I’m sorry, I missed an important detail, you should only activate (import) the LUNs using a cloned LUN other wise the replication stream will be broken. You will need to issue a manual send receive to correct the modified state or possibly redo the entire send by deleting it on the target. Locate the last successful snap on the source (ss1) and issue the following. I solved this problem. Just added -F option to second zfs recv instance in bash script. But then there was another problem: can not get a snapshot, due to the fact that zvol is busy. It was solved in the following way: stop stmf and iscsi/target services and rebooting OS. Not exactly a nice way, but I hope that I never do it . 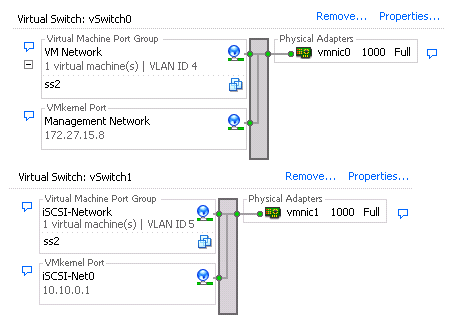 I still could not find solution for problem with exporting stmf configuration with -a option. Problem with user permissions, how can I grant zfsadm user do it? If you explore /etc/security/auth_attr you will find all the security descriptions and attributes. have been using OpenSolaris 5,11 ZFS to create iSCSI LUN for our ESX servers. I am adding another OpenSolaris 5.11 box for replication purposes. Security is not an issue, so I’m using netcat (nc). However, the destination LUN does not show up when I rescan the iSCSI host bus adapter. What am I doing wrong? How should I be doing this? Thank you. Hi Mike, thank you for you response. Do I need to do something more than just setting shareiscsi? If you issued shareiscsi=on this action would use the iscsitgtd service which is not COMSTAR and is now deprecated. The process to make it show up on the replicated target is documented in http://blog.laspina.ca/ubiquitous/provisioning_disaster_recovery_with_zfs starting at the heading Export SMF iSCSI configuration. Basically you need to load the target system iscsitgtd service manifest properties from the source and then clone the zfs data to a new floder and then change the service manifest properties to point to it.